The waitress sees scores of faces each day--faces over coffees, sandwiches, pie. Police officers see the faces of tension and flat-out fright. Every Peninsulan sees more faces in a year than can be cared for. Or even remembered. Faces all about us. Faces on every street we walk. So what's so special about human faces--that a person would choose to become a portrait painter? "There's real pleasure in studying faces for longer periods of time than a waiter or sales rep might," said Anthony LoSchiavo. The 36-year-old transplanted Brooklynite has been here for 13 years and now operates his own portrait gallery on Cannery Row. "The study periods happen with a goal in mind--to capture that particular personality, or a strong facet thereof. I don't think any work of art can encompass the entire person, but facial characteristics reveal personalities," LoSchiavo added. "Portraiture can't be called a science with hard and fast rules. My experience, however, has produced some generalities. The set of the eyes, for example. Eyes that are far apart usually reveal an individual who can weigh things objectively, see both sides of issues and perform precise tasks, I've never read about this--these simply are observations of people I've known through drawing them." LoSchiavo's face held both intensity and humor s he described an early experience with pad, pencil and quite a special subject. "When I was 10 years old," he recalled, "I sat at the kitchen table with my grandfather and did a portrait of him. It was enjoyable--I felt I understood him better afterwards; I could feel the roundness of his mustache and glasses in the drawing. And I think any child would have liked the attention I got because of that work." That same year, he entered the Brooklyn Museum Children's Art Program. Subsequent training--Manhattan School of Visual Arts, Cooper Union, Art Students League, private lessons with Henry Henche in Cape Cod--eventually was brought to bear at the Highlands Inn just south of Carmel. He did portraits there for almost a dozen years. He courted and married Rohana, his wife of 11 years. They decided to open the Cannery Row site just 18 months ago. "I'm a believer in intuition," LoSchiavo said. "If an artist is painting someone's portrait, something happens that you can't get with a camera. Painting or drawing, you get layers, since faces truly are multi-layered. The longer you study a face, the more aspects show themselves. All aspects find their ways into a portrait, eventually. The process could be called one long exposure, with intermissions." At that point, some poetry came into his speech. "The fine artist is a living instrument that can play parts of the model's own song right back to the model. I have chosen to be such an instrument because--well, faces seem to be what we look at. It's what human beings do. Have you ever spent a whole day without looking at faces? We may not notice the landscape or birds, but we always look at faces." 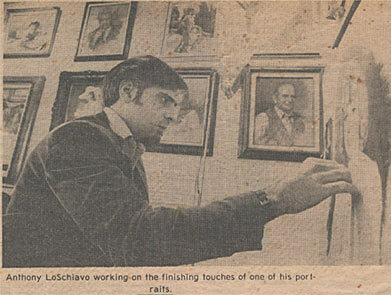 People sometimes get their portraits done, LoSchiavo said, "Because they're going through a personal crossroad in life. Sitting for an artist seems to be an ego-affirming experience that helps such people get through to their next step. If a person's negative, we sort of repel each other. I try to portray positive aspects--humor, love, spiritual insights. When someone wants another person's portrait painted, but the subject doesn't care to sit, it becomes a very static experience. The person hides from you while sitting there. So I won't do a gift portrait if the subject doesn't want it done." Does he have a favorite kind of face with which to work? "No--it's all in the way a person projects. I can see from a block away that a person's really there, and expressing. I find poker-face portraits boring." Parents are attracted to portrait artists, LoSchiavo said, "but it takes an experienced artists to get children to participate. I try to get parents away from the sitting--and spouses, for that matter--so that subjects aren't made nervous. It's a very personal experience for most people; having a relative nearby seems to change the entire chemistry." 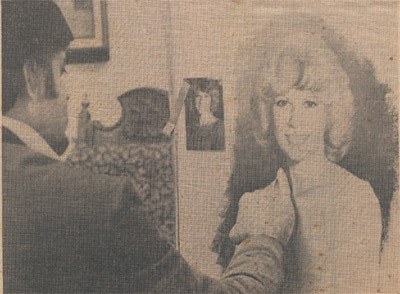 He paused to examine a recently-finished portrait. Then: "I like the way subjects become my friends. I know the person much better, for the subject puts the rest of life aside for a little while, and lets someone else in. Along with this interpersonal fact comes a highly practical one--if the work's of good quality, the subject has an instant family heirloom."